Up until the turn of the millenium shields were either painted in a single colour or had simple geometric designs such as quadrants. There was no need to decorate them extensively as they were disposable items which would be unlikely to last a battle, rather than valued items which the owner customised. The design shown in the shield below is one of the most elaborate patterns we have evidence for (from an early eleventh century manuscript). From roughly 1040 onwards, teardrop shaped shields (kite shields – shown above, between two round shields) start to appear, which offer greater body protection than the earlier round shields and can more easily be used from horseback. Our first records of kite shields come from some Northern French bibles, showing kite shields painted in a single colour or with two colour crosses. 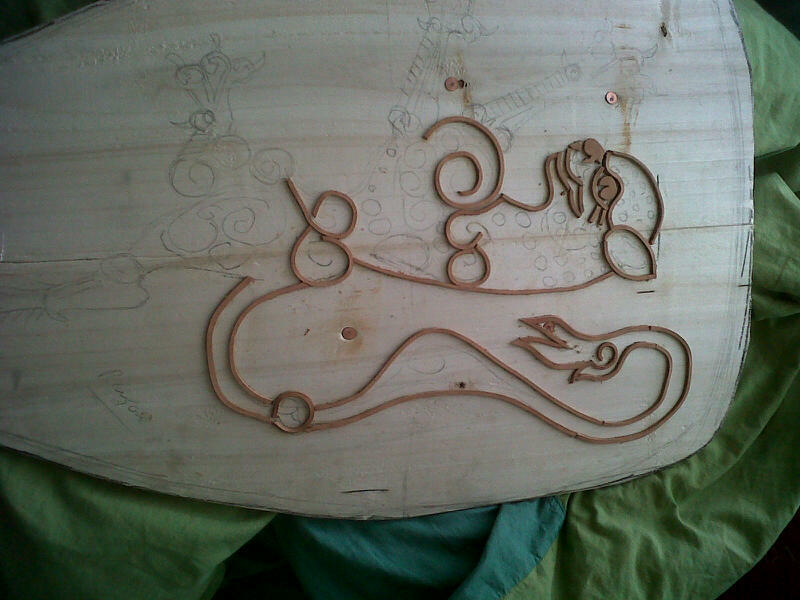 In the Bayeux tapestry most shields continue to be painted in this way, but some of the high status Normans are depicted with simple zoomorphic designs such as birds and dragons. During the twelfth century kite shields become flat-topped as a result of changes in fighting style and fashion, and during the thirteenth century they also become smaller, because the increasing use of plate armour means you don’t need as big a shield. By the end of the thirteenth century shields have become what we today call a “heater” shield. The early zoomorphic designs had also become a key part of the heraldric system and shields were decorated as a way for rich individuals to ostentatiously display wealth, and to show the allegiances of their retainers. One of the only surviving examples of a shield from this period is the Seedorf shield (1180-1225), shown below. This particular shield has clearly been cut down from its original size, possibly so it is in the most fashionable shape. It is decorated with a silver-gilded raised lion design. 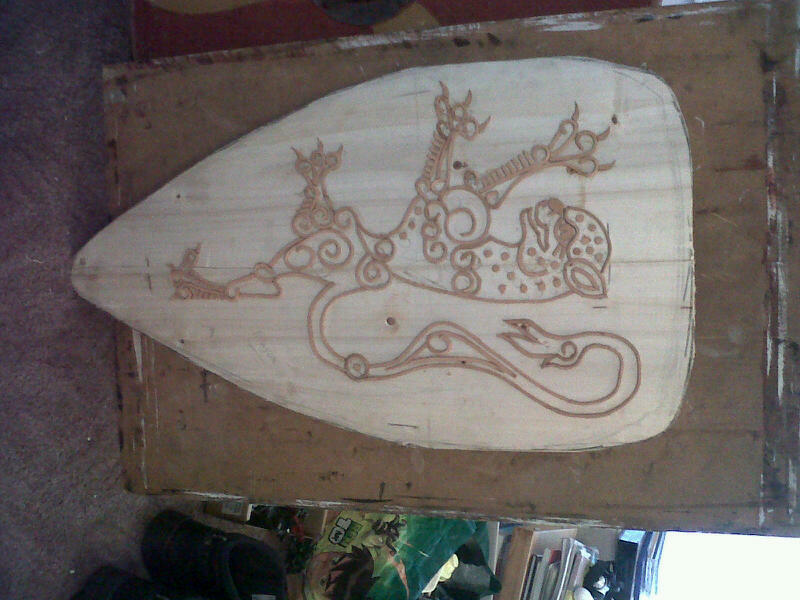 One of my recent commissions has been to make a planked shield based on this design for novelist Elizabeth Chadwick. 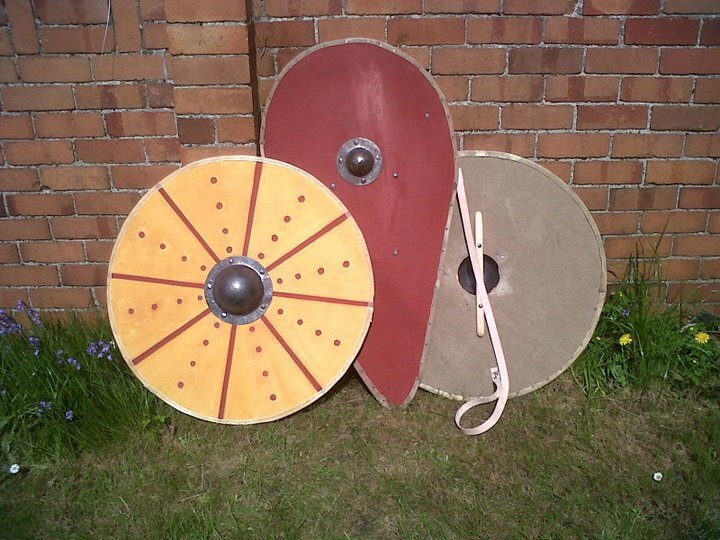 The shield itself is constructed as discussed in my post on the construction of planked shields. 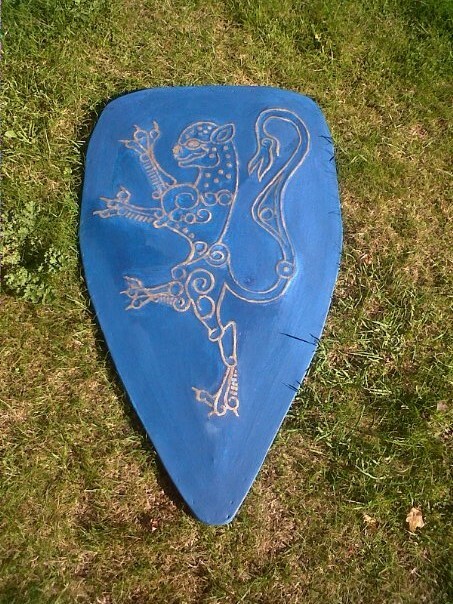 Once the design was complete, I covered the entire shield in leather and painted it blue. In the medieval period, blue was most commonly obtained using lapis lazuli, but due to its high cost only the very rich could afford to use it in large quantities. As lapis is just as expensive today, this particular shield has been painted with a modern equivalent.